A resolution finally came, at the end of last month, to the dispute over a historic time capsule found during emergency demolition of the historic factory where 19th and 20th-century Astronomer John A. Brashear produced telescopes and scientific instruments used, and some still in use, throughout the world. Also, one of those historic telescopes has now been retired. Pittsburgh's Senator John Heinz History Center, which has held temporary custody of the time capsule and contents since April, has become the permanent home of this collection of historic relics. And, some relatives of John Brashear have now donated an additional 40 historic papers and artifacts to the History Center, including Mr. Brashear's Last Will and Testament. He added, “It's nice to see cooler heads prevailed.” Mr. Fried is a historian, writing a book on John Brashear. The legal battle over the custody of the Brashear Time Capsule and its historic documents and artifacts, which included an April 1 hearing in the Allegheny County Court of Common Pleas, began after the time capsule was found among the debris during the demolition of the John A. Brashear Company Telescope Factory, located along Perrysville Avenue on Old Observatory Hill (now called Perry Hilltop) on Pittsburgh's North Side (just up the hill from the original Buhl Planetarium and Institute of Popular Science), at the end of March. The City of Pittsburgh, which had owned the National Register of Historic Places-listed building since 2012, reluctantly decided that the building had to be razed after one wall of the vacant factory collapsed onto a neighboring apartment building. The emergency contract for demolition was given to the Jadell Minniefield Construction Company of the Hazelwood section of the city. However, when the demolition contractor found the Brashear Time Capsule, he claimed that the contract gave him the right of ownership to all salvageable material, including the time capsule. After the Heinz History Center received temporary custody of the historic artifacts, negotiations between the City and Minniefield Construction resumed until an agreement was reached. John Brashear placed the time capsule in a cornerstone of the factory building on 1894 August 14. Built as a brick structure, this was the second construction of the factory building. The factory started as a frame structure, at the same site, in May of 1886. This building was home to the John A. Brashear Company which had manufactured hundreds of telescopes and precise scientific instruments for observatories and scientific institutions throughout the world, in the latter part of the 19th century and the first half of the 20th century. Philanthropist and Pennsylvania Railroad Vice President William Thaw, Sr. provided this building, and also a new home next-door, to John Brashear free-of-charge, as Mr. Thaw's personal donation to scientific research. Both buildings, which were added to the National Register of Historic Places in 2012, were less than a block from the original Allegheny Observatory, where John Brashear assisted Observatory Director Samuel Pierpont Langley (who went on to become the third Secretary of the Smithsonian Institution, then the greatest scientific appointment in America). The ashes of John Brashear and his wife Phoebe, as well as those of another former Allegheny Observatory Director, James E. Keeler, and two members of Dr. Keeler's family, are interred in a special crypt in the basement of the new Allegheny Observatory (which John Brashear single-handedly raised the funds to build in 1912) in Riverview Park. One of the telescopes John Brashear produced, at the factory building, has now been retired at the University of Toledo. 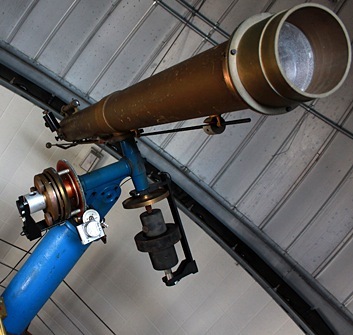 A photograph of this 6-inch refractor telescope, as installed in the university's Brooks Observatory, is shown at the beginning of this blog post (Image Source: University of Toledo). The Brooks Observatory, located on the sixth floor of McMaster Hall on the campus of the University of Toledo, is undergoing an $80,000 renovation which will include the installation of a new and larger telescope. The project also includes temporarily removing the dome and slightly shortening the size of the observatory, to improve telescope sight-lines. The renovation project is expected to be completed by the Autumn. The venerable, 6-inch Brashear refractor telescope, which is more than a century old and has served this northwest Ohio campus since 1931, is being replaced by a 14-inch Schmidt-Cassegrain reflector telescope, titled a Celestron EdgeHD 14. Next door, the University of Toledo's College of Natural Sciences and Mathematics also operates the Ritter Observatory, with a 42-inch Ritchey-Chretien reflector telescope, along with the Ritter Planetarium which has a 40-foot planetarium dome. The Ritchey-Chretien telescope, installed in 1967, is considered the largest optical telescope in Ohio, and the largest from Ohio to the Mississippi River. The historic Brashear telescope, with a beautiful 7-foot brass tube, was a gift to the University of Toledo. It was first installed atop the university's University Hall until it was placed in storage in the late 1970s. In 1987, it was installed in a new observatory, named for the late Astronomy Professor Helen Brooks and her husband, Elgin. The couple generously supported Astronomy programs at the University of Toledo, and part of the current renovation project is being funded by an endowment established by the Brooks. The historic Brashear telescope will be placed in storage and may be displayed some time in the future. "Historic Brashear Telescope Factory Time Capsule Found & Opened." "Historic Nomination: John Brashear House & Factory, Pittsburgh." 2012 Sept. 13.